“Barcelona is different” could be the contemporary echo of the famous tourism campaign slogan of the 1960’s which told the rest of the world that “Spain is different”. The distinctiveness that Spain was trading on back then is even more keenly felt these days in the Catalan capital in relation to its neighbours on the Iberian Peninsula, especially those in Madrid. Although the current campaign is largely political, it is also valid in a cultural and touristic sense. The city is unlike any other in Spain. Firstly, its geographic position makes for a self‐identity which is more European than Spanish, Barcelona being far closer to the French border than to the nearest Spanish regional capital, Zaragoza. Its history, of a sea‐faring state with a medieval power‐base in the Mediterranean and a series of foreign alliances against Spanish pretensions, has also shaped an outwards‐looking mentality. And then there is the language: on the streets of Barcelona you will mostly hear Catalan, a cousin of Castilian Spanish that feels like a cocktail of Latin, French and Spanish. Numbering around 7.5 million the Catalan “nation” is small enough to need to emphasise its sense of difference, large enough to feel confident in so doing. As a result of these large differences, visitors to Barcelona and Catalonia in general, find themselves checking their ideas about Spain and Spanishness and noting all the myriad little differences. One of these is food, where the French influence is noticeable – perhaps only in the Basque Country is food treated with the same reverence as it is here. There is good reason for this, with the proximity of both sea and mountain providing ample fresh ingredients to turn any cuisine into something special. Barcelona may boast three times the number of Michelin star restaurants than Madrid and is known for its “rock‐star” chefs such as Ferran Adrià and Joan Roca, but your average Catalan is more concerned with learning their mother’s way of making sofregit — the onion and grated tomato sauce that is the essential basis of many Catalan dishes – or dishes like empedrat, a salad of tomato, onion, peppers, olives, white beans, and desalted, raw cod, seasoned with olive oil. Art is and always has been close to the core of Catalan identity. In the c.19 and c.20 alone it provided the world with true genius in the shape of architects Antoni Gaudí (author of Barcelona’s most‐visited monument, the unfinished basilica of La Sagrada Familia) and Lluís Domènech i Montaner (whose concert hall, Palau de la Música, is a must‐see) and exceptional artists in Joan Miró, Salvador Dalí, and “adopted son” Pablo Picasso, each of whom has a gallery or museum dedicated to him in or close to the city. The chic and avant‐garde are always present in Barcelona, whether it be in the designer boutiques of the elegant Born district or the modern architecture of Frank Gehry in the Barceloneta quarter by the Port Olímpic. Yet there is much in the Catalan character that is quite conservative, less exuberant than his Spanish cousins, and deep‐rooted in tradition. History, because it is linked with identity, is perhaps more valued in Catalonia and this means that in the Barri Gòtic you have one of Europe’s best‐preserved medieval quarters where Roman walls from c.3 AD can still be seen along with a c.13 cathedral, La Seu, full of exquisite Gothic carvings, and centuries‐old traditions like the Mercè Festival still attract huge and passionate followings with their firework‐wielding devils (carrefocs), human towers (castellers) and papier‐mâché giants (gegants). And, of course, there is one passion that unites all – that of FC Barcelona – whose slogan “Més Que Un Club” is no exaggeration – it really is more than just a football club, reaching deep into popular culture, local politics, national identity and the hearts of millions of fans. All Ways Spain gave me prompt and interesting responses to my questions about a group tour with creative activities I wanted to plan in Granada and Barcelona. 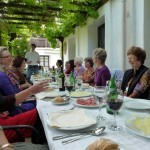 I loved their ideas and Jim set up a wonderful itinerary for my group of 18 women. Our trip was even better than I had imagined, with accommodation, meals, classes, walking tours, day trips and much more delighting our senses and filling our hearts with amazing memories. This year I am looking forward to my third group tour with All Ways Spain. I highly recommend them.